Since 1981, the United Nations (UN) has declared 21st September as the International Day of Peace. The UN invites the global states to observe the day meaningfully to strengthen peace ties between earth communities including human communities. Since, 2004, the World Council of Churches joined the UN and declared this day as the International Prayer Day for Peace. The International Day of Prayer for Peace offers an opportunity for church communities in all places to pray and act together to nurture lasting peace in the hearts of people, their families, communities and societies. From 2009, the National Council of Churches in India – Unity and Mission (Diaconia), has been facilitating and working with the Indian Churches to make certain that this day addresses issues related to peace and social harmony. NCCI – Unity and Mission joins the global ecumenical movements in voicing concerns for peace among nations, people, market places and earth communities. NCCI – Unity and Mission, has been standing in solidarity with the peace initiatives and campaigns for peace in Iraq, Syria, Palestine, Egypt, Sri Lanka, Myanmar and other countries who are in need of peace and reconciliation, and also been voicing its concern for peace within our Indian contexts. Today’s world can never be freed from conflicts. Rise of fundamentalism, Hate Campaigns by the majorities against minorities, the atrocities of unjust and inhuman policies and politics of the rulers and empires, cause conflicts. Systems like caste, ethnicity, race, gender injustice, and patriarchy, are a few of the factors that destroy peace among communities. We witness that the ecological catastrophes and climate change also take away peace from among people and make them vulnerable. On the other hand, there are efforts being made in the form of promotion of a few religious concepts that promise individual and personal peace by the practice of exercises like yoga and meditation. While the use of such tools can perhaps be seen as being important in conflict transformation, the natural trajectory issuing from the inherent implication of individual peace over societal values is inclined more towards individual satisfaction. However, God-intended peace is of communitarian and societal character rather than being individualistic. 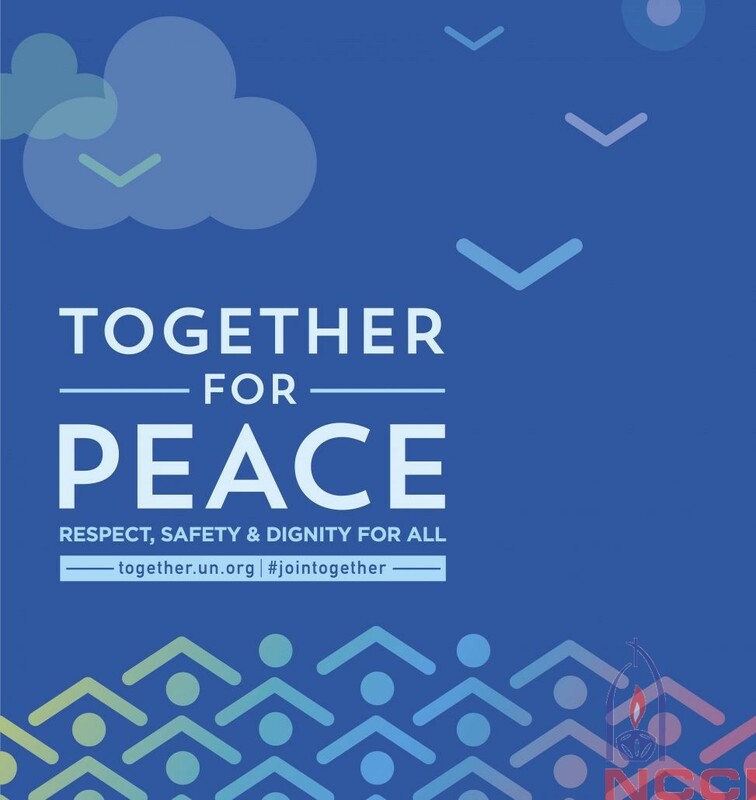 In this context, another International Peace Day has come and is challenging the global communities again to observe and commemorate this day creatively and meaningfully on the theme “Together for Peace: Respect, Safety and Dignity for All.” These are a few points that may sharpen the focus of our peace-engagements. ‘Together for peace’, urges us as members of earth communities to join hands with all of creation to not only ‘speak’ / ‘preach’ peace but also ‘do’ peace. ‘Respect’, ‘Safety’ in this context emphasizes the role of the society in building hope in humanity, that the purpose of living is in living in harmony “with.” This, in turn, establishes a society that is safe for migrants, children, women, animals, social and religious ‘outcastes’ and all other earth communities. ‘Dignity for all’ should under-gird our basic attitude of human beings towards one another. This call is to the national and international communities to ‘act early’ and more intensively in the face of human and earth rights violations, which are often the precursors of worse things to come. May this Day ‘unite us all’ as one family to deliver the right to peace by encouraging peace-champions to lay down and give-up their arms and related ideologies. Let this Day make us ‘stand in solidarity’ with the innocent victims who are killed by terrorism, war and arm-raising ideologies, the traumatized families whose homes and futures lie in ruins, the countries whose development has been set back by decades. Jesus in all his life on earth, ministry, death and resurrection, conversed about and advocated a ‘life of abundance’ (John 10:10) which ensures that through peace, life can become more meaningful. This life is contagious when hearts are moved to live life in harmony. A peace-loving God’s mission of peace is a mission mandate that every believer in Christ has to follow. Hence, as responsible faith-based human communities, how are we going to observe or commemorate this day meaningfully? Is there a possibility for us as ‘Faith-Communities’ to join with the global communities (who are made vulnerable, have suffered and lost peace due to the political actions of the dominant and powerful, climate change and ecological catastrophes, ideologies that stigmatize and discriminate our fellow human beings including women, children, gender minorities and so on), with the folded hands and on bended knees asking God’s interventions to grant ‘Peace on Earth’? Therefore, we, the NCCI – Unity and Mission, invite all NCCI Constituent Members, Inter-faith and Peace Loving Communities to creatively and meaningfully explore the implications of this day in our respective congregations, communities and institutions through appropriate peace-engagements and expressions. This will give an opportunity to propagate peace and ensure social harmony in the country. Matthew 5:9 says “Blessed are the peacemakers, for they will be called the children of God”. Thus, these efforts make us channels of peace, and entitle us as God’s children. Let us also join the World Council of Churches in praying for Peace in Palestine and Middle-East and in Myanmar, for Hunger and Poverty eradication, for relief and rehabilitation initiatives in the Caribbean and other lands that were devastated by natural catastrophes, and also for people and communities who have been under the attack of right-wing fundamentalists groups in India, who destroy peace ‘in’ us and ‘among’ us.